FULL SIZE Steel Mesh Ironing Board Table, Folding Top, Mobile Laundry Center MLC02, 6 Wheels, 3" Clothes Rack, 3 Shelves*, Hamper, Hot Iron Rest. *Replaces MLC01 without Shelves! 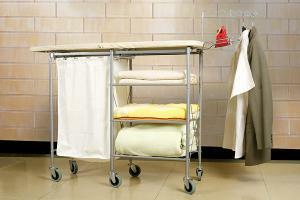 The Lifestyle Mobile Laundry Center is a unique space saving product for those areas where space is a premium. It comes complete with a "full size" fold-away ironing board (43½" long x 15" wide and a specially designed cloth cover with sewn in padding to reduce movement when ironing, 3 shelves for easy storing of freshly ironed garments, A slide out laundry hamper for holding freshly cleaned washing ready to iron, a fold out iron rest and a adjustable clothes rack. The benefits of this great product is from its working position of 44" long it folds away in seconds to a space saving size of 23" long. If you were to place in a line the equivalent in sizes of a standard ironing board, storage shevles and a laundry hamper they would take up 87" in space yet the LifeStyle Mobile Laundry Center when folded away takes up only 23" of space. The quality and finish is second to none with its silver finish, and powder coated vented steel mesh ironing board. 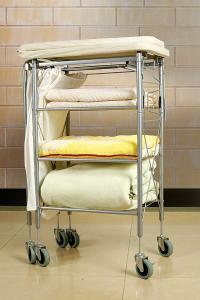 It comes with 2 locking wheels and all wheels are adjustable to increase the ironing height. Ironing height: 33" to 36"
I love the ironing board. The product came with NO instructions on how to put it together. Thankful my husband is mechanical incline .